There are 768 posts in this topic. You are on page 1 of 16. County Fair - first with the red letter game. Angle iron cradle, anti-drill coin door. Cosmetics appear good. Flaking letter A for magic screen feature. BG otherwise great! One of my favorite art packages in a bingo. ...and you haven't bought it yet? Frankly the angle iron usually turns me off. But I also lack space. Gotta move out these flipper games. I think this is the same model that Vic's friend Wayne once had, and I think he just about gave it away! No price listed on this one. Maybe this seller is giving it away, too! Nice thread! Truly an original title. Ha-ha, I may have had some inspiration. Broadway with night club backglass in Washington. Who in WA wants to buy and sell me the backglass? Wow - this Bikini is in excellent shape. In St. Louis. Great price, too. One of only two games where can bank the red letter game and play later (futurity). I hesitate to post this - I wouldn't mind making a cross-country trip for this game. In Indiana. If anyone wanted to pick up and bring to York this year, I'd love to talk to you. United Stardust - only game with a dual Roto. Excellent price for a United. 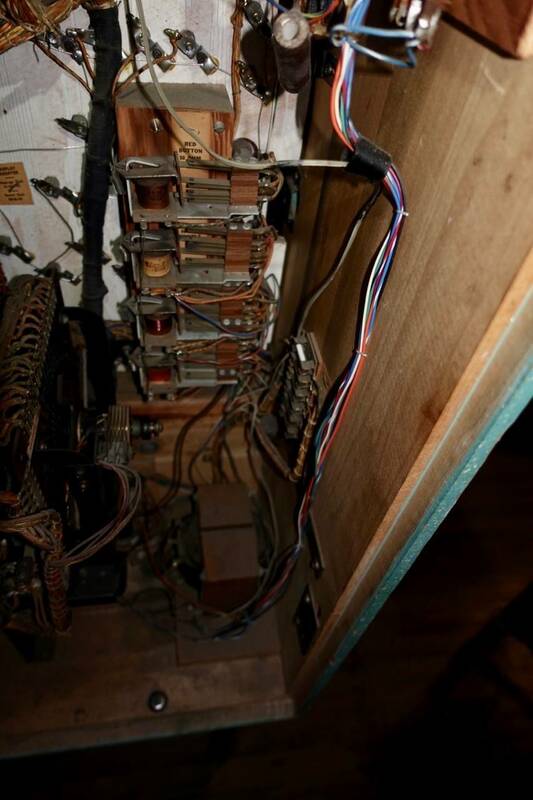 Not working, but has internals similar to a Bally. 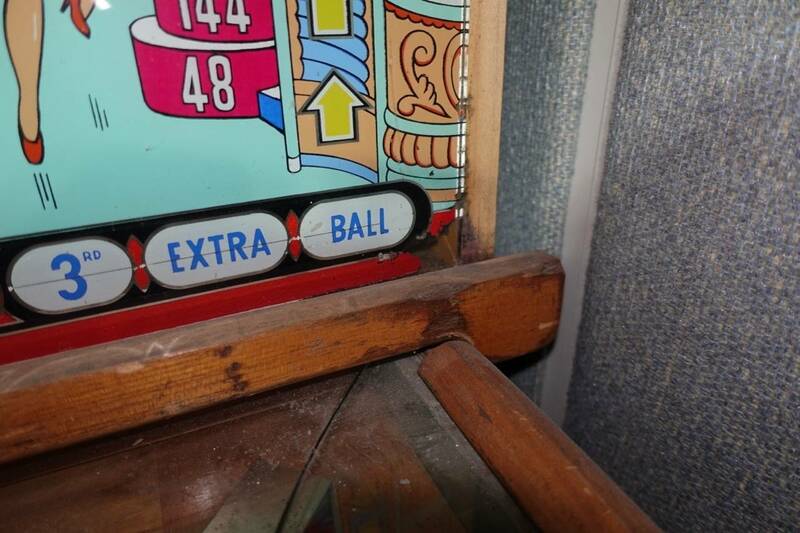 Shouldn't be hard for any Bally owner to get going. Looks in amazing shape. You call Indiana cross country? Man I could travel that far north and still not leave this state. Ha-ha, well, its about as far away as I'm willing to drive. My family typically wants to go with as we have relatives in Kentucky. Logistics get difficult beyond that. I honestly wouldn't mind hopping in the van tomorrow. Man, the light blues are flaking pretty badly on that glass, now that I look closer. Good playing game, though. Worth a haggle! ...a couple bids on it, up to $250 with not quite 24 hours remaining. Nice condition Gayety in Indiana (beside the Stardust). One of two games with the magic pockets feature. Balls hop across the first row under player control. If there were a near pristine or extra nice condition Gayety out there with a Mint backglass I could be tempted, or maybe the Gay Time title. I can remember when those words had no other connotations other than happy.... Those two titles have a some of the nicest backglass art of the period for Bingos I think. Very attractive. I could see where they would make you want to dump your money in them back in the day. I have a Gay Time and love it. Once you play the feature a bit, you'll start seeing the winners from moving the balls and magic lines. Always exciting! Newcomers are very attracted to it, and always laugh and love the magic Pockets. Many newcomers have a hard time conceptualizing winners. Great games! That Gayety has one of the best backglasses I've seen. The red/pink really flakes away on most. I hope someone snaps that up. Only downside to that particular example is the lockbar and cabinet need a good cleaning. I have seen your Gay Time in postings here on Pinside. It's very nice. Gay Time or a Gayety in tip top shape would definitely be on my short list. At some point I'd like to get one really tip top example of a Bingo. For now Palm Springs is nice to cut my teeth on. I can't wind up with too many of these things though. Space is maxed out with my Flipper games. I actually keep a few games at my son's house as I'm full. He gets them as loaners to play and/or to sell when something else finds it's way into my house. Space is maxed out with my Flipper games. Cue BingoPodcast. I can hear it now, "Flip that ratio, you'll be better off." Note the date of production. Topic for an upcoming episode. Last EM 6 card made by Bally. Magic number and Quadruple scoring on random cards. Super fun. C'mon. A mere 12 hour drive! Seriously though, maybe the seller would be willing to meet you halfway or something. Hmm. Not a bad idea. Not sure if they're pinball people? Guess there's one way to find out. Hi-Fi. The only bingo with the 'bump' feature. 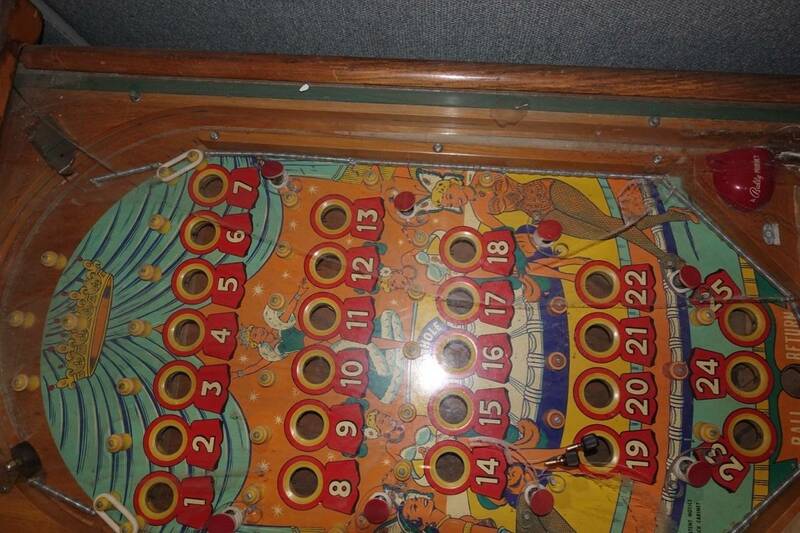 Moves the whole playfield using a flipper button. Price is crazy, but cab and glass are in good condition. 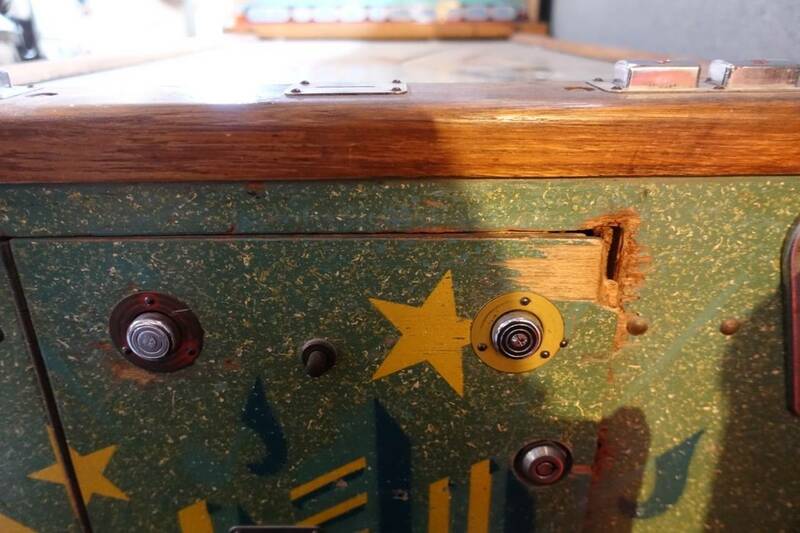 Can't see playfield and lockbar instruction plate is hosed. United Caravan in Fresno, CA. It has typical roto mech wear at the top of the bingo card, otherwise glass is less flaky than mine! Door has some weird aftermarket bingo on it and is super dusty. Needs cleaning, but back seems to be in OK condition from the one sideways pic with the door cracked. Weird. All three of the United roto games are on eBay right now. Starlet - $750. Typical roto wear on backglass otherwise looks pretty nice. OK, another crazy price - Can Can for 1,100. 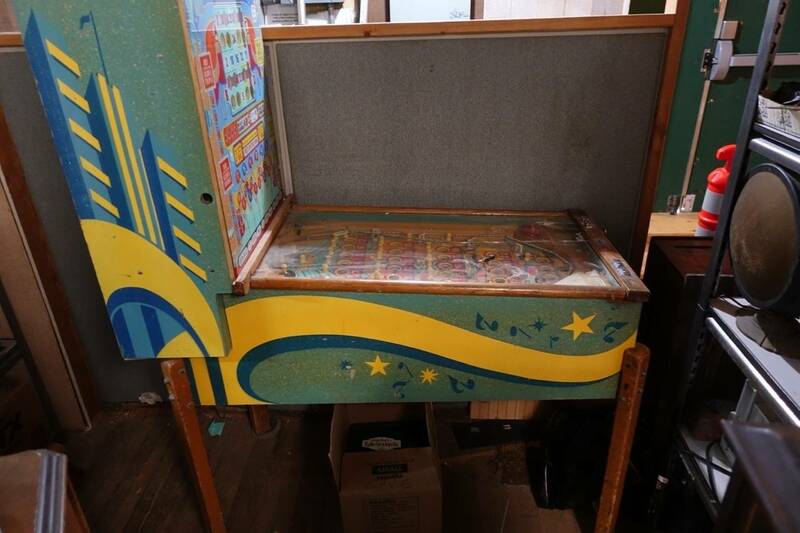 Can Can is a fun game, but with all the cab artwork removed and a floor length cabinet with payout hopper installed, and lockbar with aftermarket cladding? None of that increases value for me. Two playfields: Big Show? And Double Header. Now, where's the rest of that Double Header? A rare game becomes more rare. Variety - the first game with moving numbers. 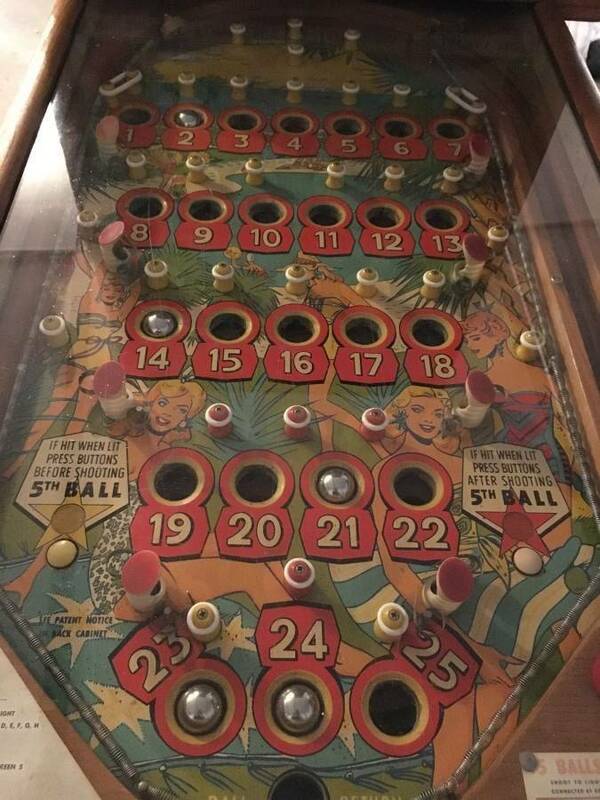 Looks to be in pretty good shape, most likely not working, missing playfield glass. Great game! Some good games here - six cards (Wall Street and High Flyer), Tahiti, and United Nevada - each $300. 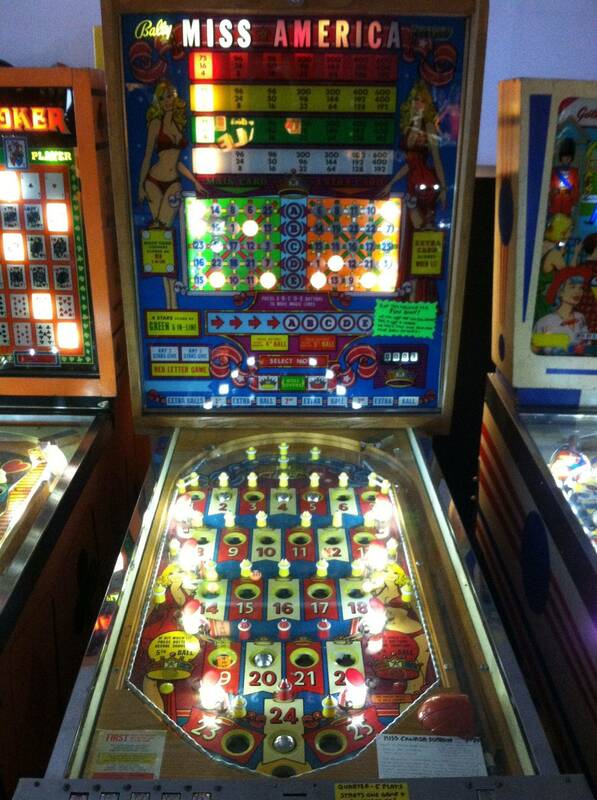 ...I'm pretty sure this is the "other bingo" the Pinball Hall of Fame in Las Vegas has. So, y'know, there's a chance to play this on location before you buy it? Twin Joker is supposed to be a fun two player game. I don't really know anything about the gameplay, as I've never seen one in person, but as I recall, there is no replay register but whoever has the highest hand would win. If anyone's played one, would love to hear about your experience. ...at least that was the PHoF Bingo (and Bingo-esque) line-up as of Summer '15. Twin Joker Bingo is way cool. Wall Street renamed as Shoot-A-Line. 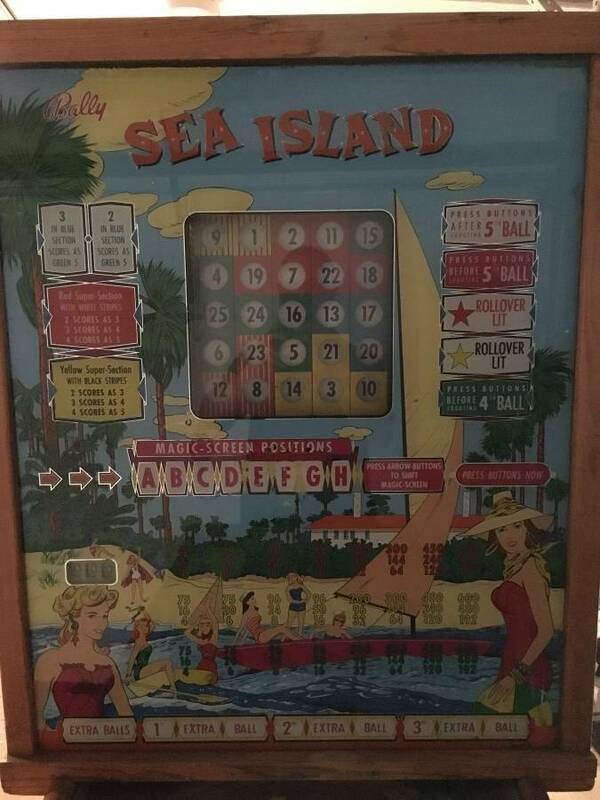 In PA, sold by TNT Amusements. 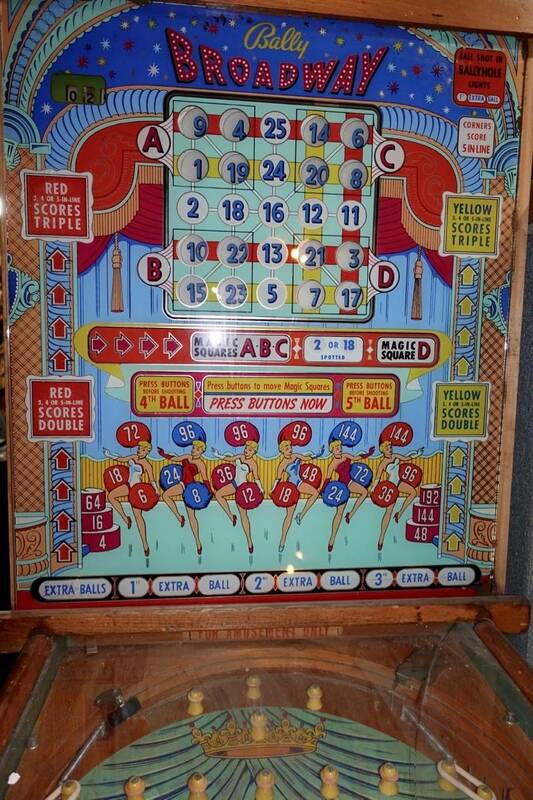 It has the playfield of Bally's 'The Twist' with the cab repainted. $325. 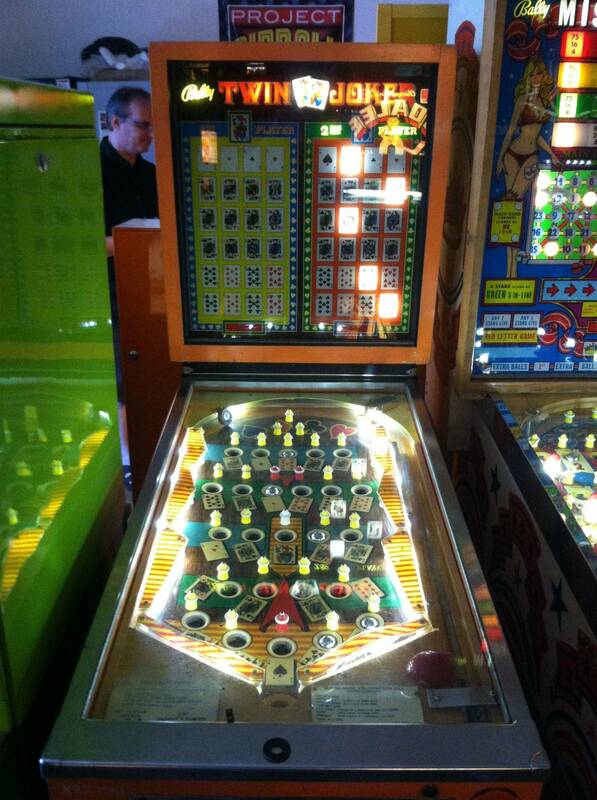 Pretty interesting, since I don't think the playfield for The Twist is plug and play with a 6 card. Shutter motor switch configuration is likely quite different (I don't know that for sure, but I'm pretty sure)! Gayety - the first Magic Pockets game. In SF area. $750. 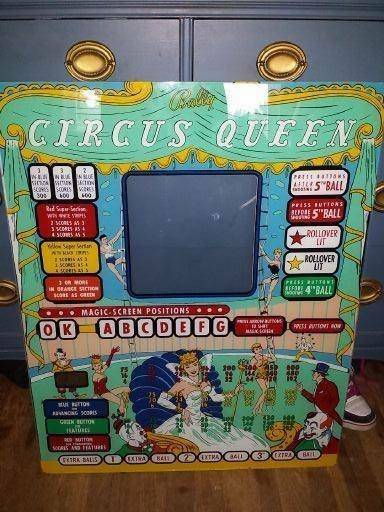 This one looks in really nice condition, slight fading on the cab (although that may just be the camera exposure or lighting), no good straight on pics of the panel, but likely slight control panel wear as typical for this era. Can any of you OK game players spot the issue with the Miss America above using LEDs? Also, if you need it, Coinopwarehouse is selling NOS playfields on EBay for many titles. 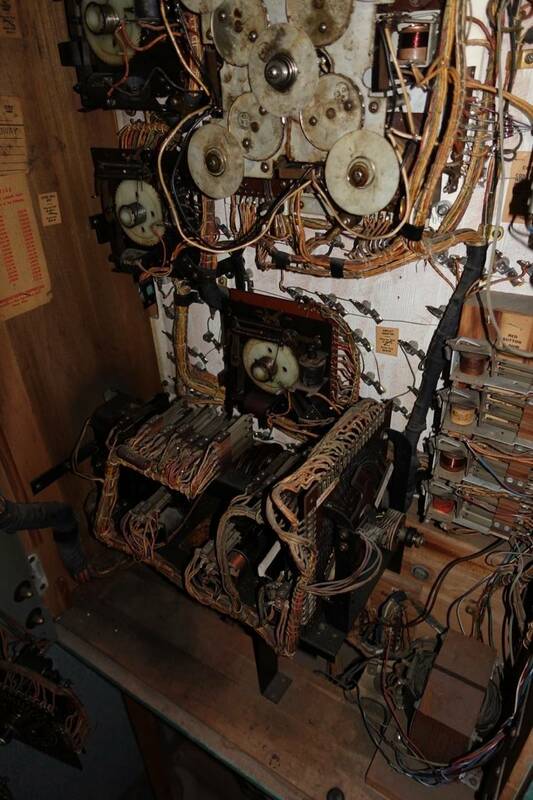 Been thinking about pulling the trigger on a new Ticker Tape playfield (but it has some damage). Coinopwarehouse is selling NOS playfields on EBay for many titles. Multiple red letters due to the resistance difference? Don't know how 'nice' you would call this but I would rather post the bingos I find here instead of on the Project Pin thread. Please let me know if the consensus is to post project bingos elsewhere. 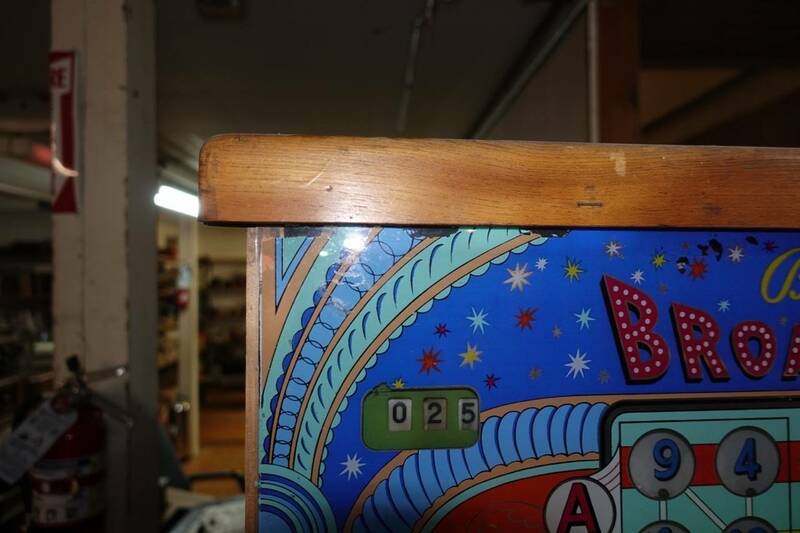 Condition: Front of cabinet rough. 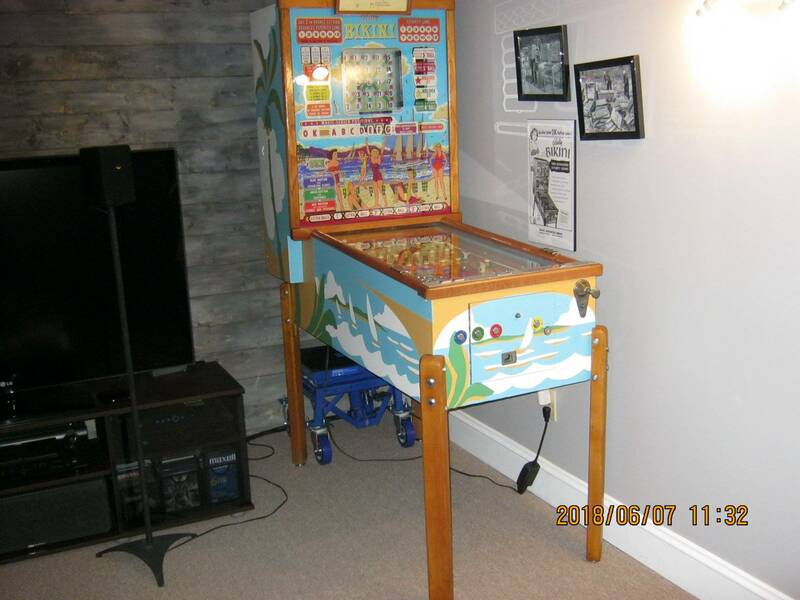 OP: "Selling this nice Bally Touchdown Pinball Machine. 2202 of 5000 built. 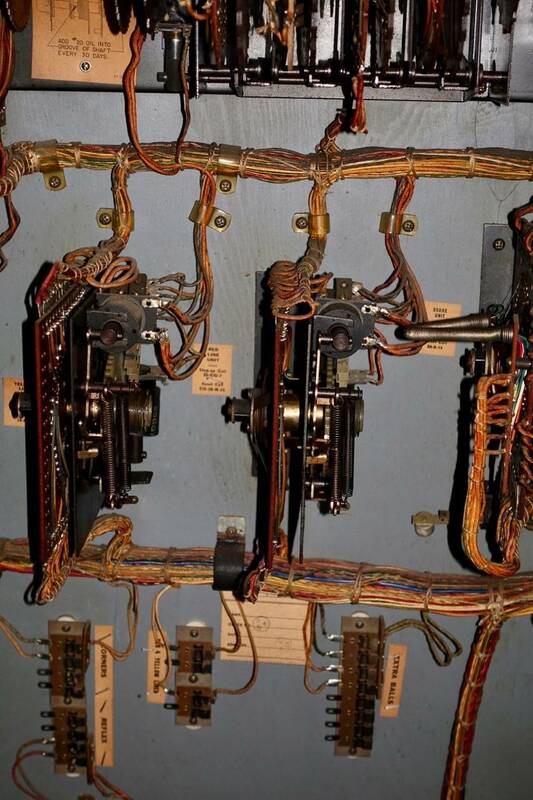 No blown fuses or burned wiring. 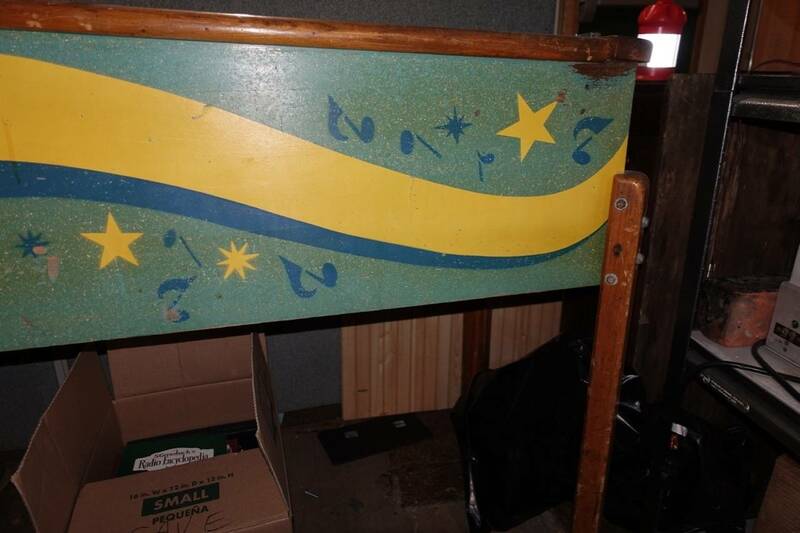 Would be a fun restoration project for a pinball machine enthusiast. Parts are still readily available on line. 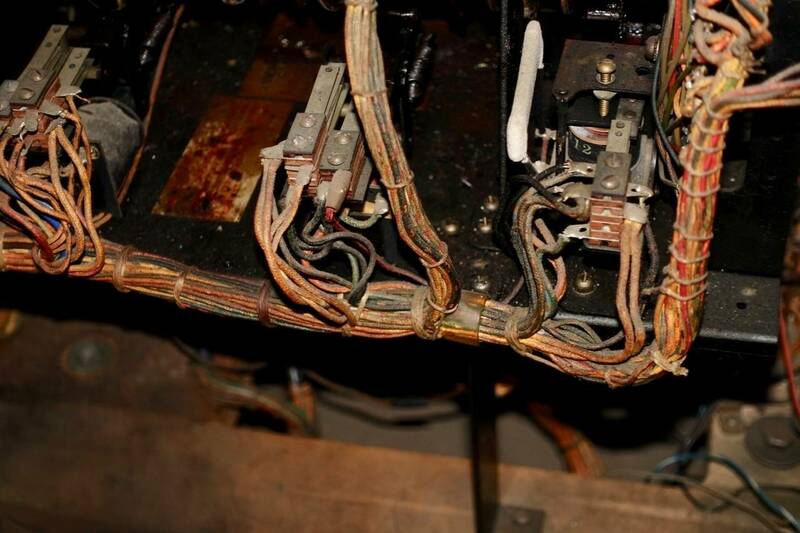 Manuals/schematics included." The red letter circuits require the resistance difference between a 55 (which should be red) and a 47. Using a 44 or other bulb that does not have the exact load of a 55 paired with 47 will not work. Please let me know if the consensus is to post project bingos elsewhere. Here is fine! And it doesn't look bad to me! Note on Touchdown that Bally used a special motor control circuit only used in one other game. Motor 'seeking' is controlled by the variator unit disc. 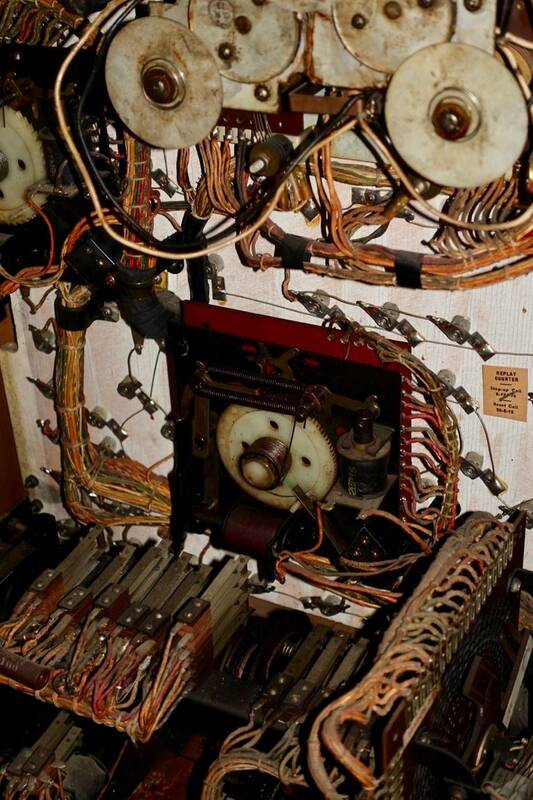 Otherwise, circuitry is similar to other bingos. Played Twin Joker at The York Show several years ago. It's a dud. All the ones I've seen appear to be in super nice condition tho ... (likely because no one plays them more than a few times). Pretty sure no one's ever said "Twin Joker is my favorite"
Yeah... Most of the card games with a bingo layout don't seem super exciting to me. Mostly two player type games like twin Joker. Probably fun over a drink with a buddy. I've never played one, though. The one that's been on eBay out in Colorado (Williams "Yukon") looks pretty interesting.